During June 2014 Google held their annual I/O conference in the Moscone Center, San Francisco. One of the biggest surprises to emerge from the event was the news that the tech giant aimed to bring the Chrome and Android operating systems closer together – with the first Android apps becoming available on Chromebooks by the end of this year. Google have issued a word of caution, explicitly stating that they have no plans to support every app immediately. Nonetheless, they have asked for user recommendations, and you can let them know your thoughts via an online form. The lack of a native Skype app is the elephant in the room of the Chromebook operating system. Its absence is the of the most frequently cited reasons for people not buying a Chrome OS machine on forums and chat boards, but until now Google have refused to cave in to consumer pressure. The reason that a Skype app is missing has been much speculated about. People have suggested it’s a consequence of ongoing Google vs Microsoft wars (a war that is also responsible for the lack of integrated Google calendar support in Windows 8), while others have said it’s a brazen attempt by Google to force as many people as possible onto its Google Hangouts video chat service. Skype can be used on a Chromebook by installing an alternative Linux distro How to Install Linux on a Chromebook How to Install Linux on a Chromebook Do you need Skype on your Chromebook? Do you miss not having access to games through Steam? Are you pining to use VLC Media Player? Then start using Linux on your Chromebook. Read More and installing the Linux version – but it’s cumbersome and not appropriate for less-technologically savvy users. Twitter itself is not in the Google Web Store for Chromebooks. TweetDeck is available for Chrome Don't Clutter Your Computer: TweetDeck For Chrome Is A Complete In-Browser Social Client Don't Clutter Your Computer: TweetDeck For Chrome Is A Complete In-Browser Social Client If you use Twitter in any capacity, there’s a 75% chance you’re using a client. After all, Twitter’s web interface is not the most convenient, and if you’re keeping track of more than one account,... Read More , but like so many of the apps in the store it’s really just an elaborate shortcut to the web client. The social media service has approximately 274 million active users, and deals with nearly 400 million tweets and 160 billion search queries every day. These figures have propelled it to be one of the ten most visited websites in the world with estimated revenues of $664 million per annum. The fact that there is no native Chromebook Twitter app is ridiculous, especially given the Android Twitter app has been downloaded more than 100 million times. Like TweetDeck, Evernote also has a listing in the Chrome Web Store. Unfortunately – and also like Tweetdeck – the ‘app’ is nothing more than a link to the website. We at MakeUseOf are huge admirers of Evernote’s capabilities, and lots of us use it around the clock to organise our workflows, notes and ideas. A native app could have huge potential; the Chromebook is desperate for a well-recognised project-management and organisation tool that has offline capabilities. It’s not hard to imagine that Evernote could fill that gap by creating an app that works offline and syncs with the cloud every time it picks up an Internet connection. Thankfully, at the I/O conference Google confirmed Evernote was one of three apps that had already received clearance to be ported from Android to Chrome, along with video service Vine and the personal magazine app Flipboard. Google’s own Play Newsstand app is the successor to Google Currents. It allows you to add and customise news sections that interest you whilst also adding your favourite magazines and newspapers to a personalised section. The app on the Android is beautifully designed and offers a sleek and professional way to keep abreast of new content. A full-screen native Newsstand app on the Chromebook would work well, giving the users the feeling of reading a magazine. It also gives Google another way to encroach on territory that has been under the domain of tablets for the last few years. Chromebooks have nothing similar at the moment, though the aforementioned porting of Flipboard might mean that Play Newsstand doesn’t make its way across the divide just yet. Lux is a fantastic Android app that has saved users countless hours of battery life by automatically managing screen brightness. It allows the brightness to be dimmed below what the device would ordinarily allow, and users with rooted Android devices can even take it a step further by programming sunrise and sunset times, auto-managing profiles, and setting the screen’s colour temperature. A Chromebook version of Lux would be especially useful for users who have a 12 inch (or less) screen and use their device more akin to a tablet or phablet – either in bed, on overnight flights or on a job where they work late into the evening. The extra features for rooted Android devices could be enabled by putting a Chromebook into developer mode. K9 Mail is the most famous, and arguably the best, mail client for Android K-9 Mail - The Best Alternative Email Management Solution For Your Android [1.5+] K-9 Mail - The Best Alternative Email Management Solution For Your Android [1.5+] The great thing about Android is that there usually are alternatives to be found that address the shortcomings of one program. Google Play gave me the rather un-mail like name of K-9 Mail. But from... Read More . It could fill a gaping hole on Chromebooks by offering online and offline management of several email accounts rather than forcing users to access their accounts through the web clients. At present, the only way of achieving something similar is to register all your email accounts to run through your primary Gmail account, but this is not practical for people who have lots of accounts or want to keep their personal and work emails separate. 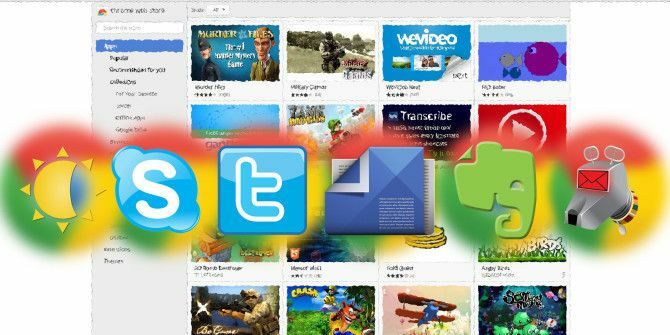 There are four more apps that immediately spring to mind when thinking of apps to bring from Android to Chromebook – StumbleUpon, TuneIn Radio, SoundCloud – and WhatsApp. StumbleUpon has a Chrome extension, but lacks a native app like the phone, tablet and Windows 8 versions. A native TuneIn Radio app that didn’t need to run in the browser and loaded faster than the main website would be a welcome additional for those who like to have background noise while they work, and Soundcloud’s increasing growth as a music discovery tool means it would benefit from having more than the web link which is in the store at the moment. WhatsApp’s inclusion in a list like this is obvious. The instant messaging service has become hugely popular and is now used by the vast majority of smartphone owners. You can already receive the messages in Chrome by using Pushbullet PushBullet for Android: Push Files & More To Your Android Phone From Your Browser PushBullet for Android: Push Files & More To Your Android Phone From Your Browser Read More , but a way to reply to WhatsApp messages would be welcomed by thousands. Which Android Apps Do You Need? One of the selling points of Chromebooks is their stateless operating system. It means your computer can easily stay virus-free and doesn’t become sluggish under the weight of orphan files after years of use. On the flip side, a stateless operating system doesn’t have many native capabilities, but Google claims it doesn’t matter because there are thousands of apps to extend your system. Sadly, the Chrome Web Store remains full of apps that are nothing more than links; after three years Google needs to start improving the app store quickly. The news that Android apps are on their way is a welcome development, and if Google can pressure developers into making these apps work offline they will open up their operating system to a whole new world of enthusiasts. What Android apps would you like to see arrive on your Chromebook? Let us know in the comments below. I need K9 Mail for Chrome. Chrome Book had to have GNU/Linux and Sylpheed for email. App hosted in Google cloud, but email synced locally from IMAP to save bandwidth. ES File Explorer for creating and opening encrypted zip files. And Google Earth. ES File Explorer for its ability to connect multiple cloud storage accounts from the same provider and to access network shares via traditional LAN protocols. Firefox, so I can get decent ad blocking and a more user friendly extension ecosystem. And also ignore the entire point of getting a Chromebook. Beyondpod, since it synchronizes across all my devices. Quickoffice Pro, my Android document suite of choice. Doubletwist, mostly because I like its presentation and feature set for locally-stored music. XBMC, because that would be a killer application on a $200 Chromebook. Forgot to mention, Dolphin browser and Firefox would be nice on Chrome OS too. After using both K-9 Mail and Blue Mail, I would argue that Blue Mail is as good or better and definitely better when it comes to visual design. Just my opinion though. Am really liking the visual design of Blue Mail. As an Asus C200 chromebook user, I'm loving my chromebook, crouton on my chromebook, and would love to see most of the Android library on Chrome OS.